Some time ago I dreamt that the new issue of ‘Interzone’ featured on the cover a story about giraffes in space. When I woke up, I thought it was a good idea and jotted down some notes, but sadly haven’t written the story yet. 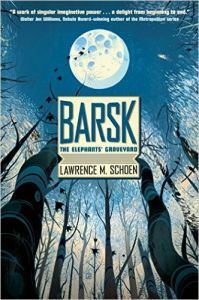 Subsequently, I was intrigued when I saw that Lawrence M. Schoen’s debut novel ‘Barsk: The Elephant’s Graveyard’ is about elephants in space.